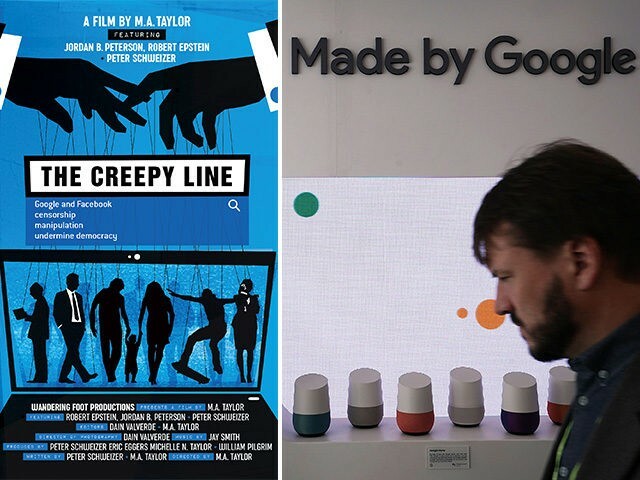 The Creepy Line is a new feature-length documentary that explores how Silicon Valley tech companies can use their vast influence to crack down on speech and undermine democracy. The film focuses specifically on Facebook and Google, and analyzes exactly what these companies do once they have unlimited access to user’s data. The film uses first-hand accounts, scientific experiments, and detailed analysis to explore the risks of allowing these two tech giants free reign over the personal information of millions of people. The new feature-length documentary is directed by M.A. Taylor and features interviews with prominent figures such as Dr. Jordan Peterson, Dr. Robert Epstein of the American Institute for Behavioral Research and Technology and Peter Schweizer, President of the Government Accountability Institute and author of Clinton Cash. In recent months, Breitbart News has received a number of exclusive looks inside Google and their blatant displays of political partisanship. Breitbart News Senior Tech Reporter Allum Bokhari revealed a leaked video from inside a Google TGIF meeting recorded after the election of President Trump in 2016 in which Google staff and executives express their dismay and horror at the election of Trump. The Creepy Line explores the measurable impact the Masters of the Universe have had on elections. Google, Facebook, and the other companies that control social media are continuing to apply more pressure on voters in support of their favored candidates and ideologies after they failed to elect Hillary Clinton in 2016. The Creepy Line is an important examination of just how important the battle for free speech online has become.